I am very happy to report that I will be visiting Napa this weekend! It's about an hour and a half away and I can't wait to get there. Some people get excited to visit the world class wineries or enjoy the stunning views. I get excited about eating lunch at Taylor's Automatic Refresher! We are meeting up with some old friends from college, although this time we both have babies in tow. So, it should be a great afternoon. 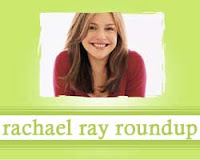 Food for Thought features a tweak on Rachael Ray's carbonara recipe (a comfort food favorite for me). Cate O'Malley of The Cook's Kitchen is not impressed with a recent idea from Rachael Ray's magazine. Foodie Wife of A Feast for the Eyes made Chicken with Wild Mushroom and Balsamic Cream Sauce. Kristin of Sogkonnite Living made a recipe that I have my eye on: Fancy Manchego Mac and Chorizo. Kait of Pots and Plots adapted a recipe for Turkey Meatballs with Paprika Tomato Sauce from Every Day with Rachael Ray. Priscilla Tsai of Eat My Charlotte made what is probably my favorite RR buger recipe: Bacon-Bit Burgers with Smoked Gouda and Steak House–Smothered Onions. Josh Ozersky of The Feedbag will be guest blogging on Rachael Ray's website. Mare of Meet Me in the Kitchen made S'More Lava Cakes. Gatecrasher shares a story that shows Rachael Ray has a great sense of humor. I love Napa! It's about 3 hours away from me. I love visiting the CIA in St. Helena. Last time, got to take a class in making peach crepes. I get lost in their gift shop-- all those kitchen gadgets...it's better than a candy store. Please share more info on restaurants. I'd love to know more places to enjoy in that beautiful area. Ooh, I love the CIA. We went there for dinner on a bachelorette party and it was outstanding. You reminded me to add a link to Taylor's. I swear the burger on their splash page is exactly what they look like. Well, I don't know that the Albany/Schenectady/Troy area(RR's stomping grounds)has any unusual eats or rituals that would interest Bourdain for his show "No Reservations", but do you think if Team Rachael asked Bourdain to appear on her show, he wouldn't turn it down?